Friday night, I had been in bed for more than three hours but I just couldn't get myself to sleep for a number of reasons. One obvious reason was my very big belly making it really uncomfortable to lie down in any position. Getting up from lying down is definitely a pain but not as painful as changing position while down on my side. With all of the pains that I am feeling right now, I still feel blessed that I have come this far with my pregnancy. I am 37 weeks pregnant today with our third girl. This has been a great accomplishment considering my pregnancy history with Mikelle and Rianne. I gave birth at 30 weeks and one day with my twin girls who were born at 2.5lbs each. 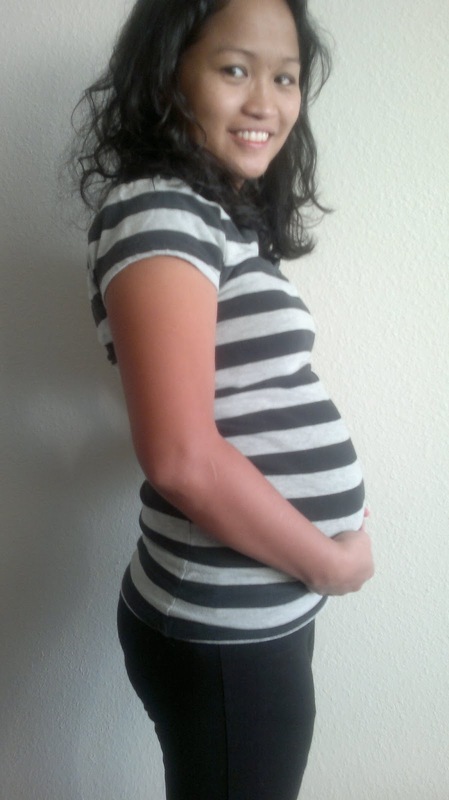 Counting each day and each week that passes made this pregnancy seemed really long. 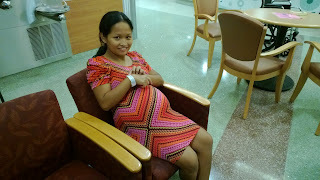 We feel relieved when we finally reached week 30, not because we were sure that we will make it till the end but at least we would know what we might be dealing with had I deliver that early. We are thankful for those who remember us in their prayers everyday and we thank God for each day longer I got to keep my baby inside me. This pregnancy has been pretty easy compared to my first. For one, I don't disguise food, I like it. I can drink water and don't need to rely on soda and cheerios for sustenance for months. I am not on bed rest and can move around, though walking and standing have been a little difficult lately. Things are not as smooth as I wish they would be, though. I was diagnosed with gestational diabetes at 31 weeks and have had to be on diet for the rest of the pregnancy. I have to take blood sample and check my sugar lever twice a day every other day on weekdays. I as well have to go to do the NST (non-stress test) every week to make sure that baby is fine. High sugar level during pregnancy is not healthy for babies and might cause several complications during pregnancy, delivery, and growth of the baby. I got scared when I found out about my diabetes but managing it has not been as difficult as I thought it will be. With all of the craziness that has been going on with looking for and buying a house, preparing to move out of our apartment and move in our new place sometime in late May, pre-k registration for our girls, pregnancy and delivery, we are definitely busy people. It is insane that all of these things are happening this month. I am due on the 26th of May but am scheduled for a C-section on the morning of May 19th. I am not sure that I will make it that far, but who knows. I have been feeling worse and contractions are becoming frequent and stronger by the day. Baby is very active, which I love, and she is pretty strong too. She is most active in the evening before or during bed time. Friday night she kept me awake for hours with contractions. Eventually I had to wake Carl up at 2 AM so he could take me to the hospital to be checked. They hooked me up on monitors and put me on an IV. Contractions were three to ten minutes apart but eventually went away after they gave me the IV. We were released by 9am and sang happy birthday when we got home for my dad's 63rd birthday. We thought we would have our baby on my dad or mom's birthday (which is today) but looks like she does not want to share a birthday with anybody in our family. So, we'll be able to hold her in two weeks or maybe earlier. I just hope that Carl will be around to drive me to the hospital if ever she decides to say hi early. We are not sure if Rianne and Mikelle really understand what is going on but it is always sweet when they talk of and to their baby sister by talking to my belly. They call her by name and share their toys with her by piling up all of their stuffed toys in her bassinet (no, the name is not public yet). We are excited to have her join us and we hope and pray that the remaining days will be smooth. At the Bayfront Baby Place waiting area. On another note, Happy 63rd birthday to my dad (May 4) and 51st to my Mom (May 5). We are blessed to have you here with us. Life is so much easier for us with your assistance and love. We don't how we would be able to handle everything with all the craziness that is going on without your help. Our twins are now big girls. Thanks to my awesome husband. We are so blessed to have a responsible, loving and caring husband and father. It is a blessing to have you in this journey! This entry was posted on Sunday, May 05, 2013 and is filed under . You can follow any responses to this entry through the RSS 2.0 feed. You can leave a response, or trackback from your own site. You can do it! You are almost there and then baby will be here! We are excited to hear of her birth. I'm excited for you and glad that this time around has been a lot easier on you.